Interim Rangers boss Graeme Murty has been receiving assistance but has not named the person who has been helping him. Murty made the revelation in the wake of the 2-1 defeat at Inverness Caledonian Thistle on Friday night. "The board have taken steps, they have offered me help and I have taken advantage of that help," Murty said. "At the moment that will remain private between me and the person who is helping me." The result in Inverness makes it two league defeats in a row for Murty's side, following the 2-1 loss at Dundee. The Ibrox outfit fell behind to Greg Tansey's strike on the stroke of half time but squared it from the penalty spot thanks to Martyn Waghorn. Iain Vigurs then missed a penalty for Inverness but Billy Mckay's overhead kick sealed all three points for the home side. 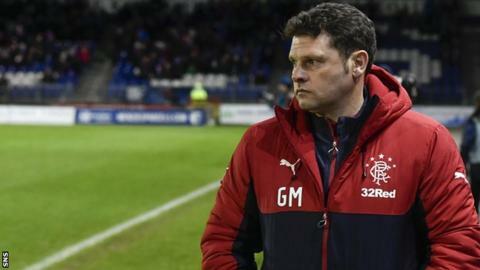 Murty, whose team host St Johnstone on Wednesday, said: "The board will take their time and appoint the person that they think should be in place at a time of their choosing. So until I'm told otherwise I will carry on doing what I'm doing. "But I have to say, my help and the people helping me, doesn't take away from the fact that the players have to focus what they can control, and they can control their attitude and performance. "You haven't got the space and I haven't got the time to convey how I'm feeling. Suffice to say we are walking away with nothing and that's not good enough for this football club. This club has been and will be again about winning football matches and we haven't managed to do that. "We weren't clinical enough in either box and we paid the price. "You saw a group of players who were focused, I thought for 25 minutes we were great, but it's the same old problem, if you don't score when you have the chance and you let in too many goals, then you are not going to take too many points home."